The St. Lawrence Market Complex consists of three buildings: St. Lawrence Hall, the South Market and the North Market. St. Lawrence Hall and the South Market are heritage jewels to be retained, while the North Market property requires redevelopment. The City’s redevelopment strategy is to replace the existing one storey North Market building with a new multi-storey, multi-purpose building (of approximately 11,237 square metres above grade) that houses the established Saturday Farmers’ Market and Sunday Antique Market, Toronto Court Services’ court rooms (for offences under the Provincial Offences Act) and administrative offices on the upper floors, and a 250-space underground parking garage. The City has selected a two stage design competition process to deliver the design of this project. The competition presents architects with the opportunity to create a new North Market building that has relevance for the future, is sustainable and energy efficient, and expresses its function as a place to be. A public market has existed in one form or another on the North Market site since 1803 and will continue to do so well into the 21st century. The question of how to combine the long-standing civic function of a public market with an expanded role that reflects the diverse and multi-faceted needs of the City - in a building that is still capable of representing the history of the area - poses a unique and exciting challenge. The City is confident that the design community can add architectural excellence to the St. Lawrence neighbourhood, and create an exciting and respectful building on a site that is considered to be the birthplace of the city. On June 7, 2010 Mayor David Miller and Councillor Pam McConnell (Ward 28 Toronto Centre-Rosedale) officially announced the ‘Red Design’ by Adamson Associates Architects and Rogers Stirk Harbour + Partners as the winning design in the St. Lawrence Market North Building Design Competition. 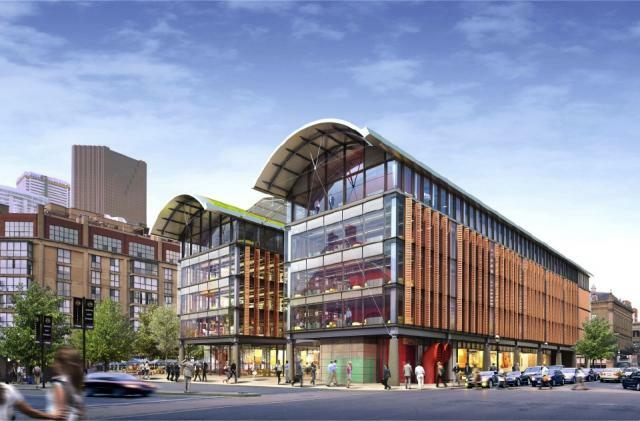 Included in the new, winning design is a four-storey structure that allows market shoppers to view life and activities on Front Street, Jarvis Street and on Market Lane Park from within its glass atrium, effectively creating an open indoor market that resembles a fresh, outdoor setting. Shoppers will also be able to see the South Market from inside the building and appreciate a dramatic view of St. Lawrence Hall to the north, creating a strong visual connection with all three buildings of the complex. A covered street is created in the centre of the site that opens up views and pedestrian routes from the South Market, through the new building, and into St. Lawrence Hall. At the lower levels the covered street is the North Market. The Market will have a five storey high central space with natural light and natural ventilation, giving it a scale and quality appropriate to its function, and continuing the scale of the South Market.